Cuddly Big Caysey, the sleepy Doggie pillow (60cm) to welcome the growing little miracle. 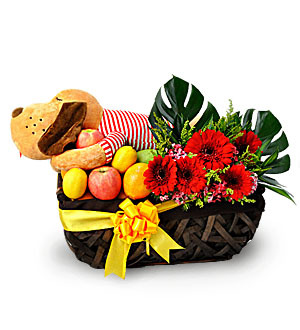 Doggie Pillow is accompanied with a basket of assortment of Fruits (4-5 types) and beautiful Gerberas flowers for the estatic new Mommy! Immediate same-day delivery applies for delivery within Klang Valley. For outstation deliveries, fresh fruits and flowers will be replaced by artificial pomander flowers, 6 bottles of chicken essence and Huggies Baby Diapers 12pcs. For outstation deliveries, please provide at least 3 days notice. Call Giftlab at 03-78830233 / +6012-6915200 or email us at sales@gift-lab.com for assistance.